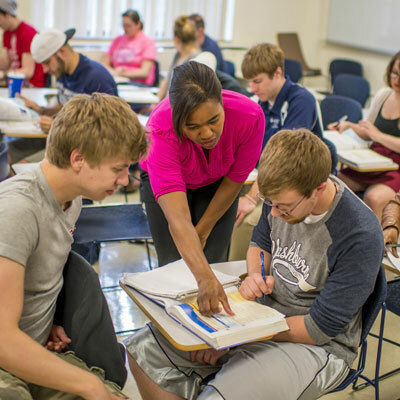 If you plan to major in Spanish, we encourage you to begin your language studies as soon as you start at Washburn and continue to enroll in at least one language course each semester until graduation. Learning a foreign language is a cumulative process; it will benefit you to stay immersed in the language every semester. In order to major in Spanish, a student must complete 30 hours of course work beyond the 100 level. SP 101 will count as part of the total number of hours needed for graduation. SP 102 fulfills a general education requirement in the Humanities. A minor in Spanish is also available for students interested in supplementing another major with knowledge of the Spanish language. You can earn a teacher certification in conjunction with the education department. + 9 hours of correlated courses -- These courses are intended to complement and broaden your Spanish classes. They are selected in consultation with your advisor. Portfolio: All Spanish majors are required to present a portfolio after the 202 level course. They are then required to keep updating their portfolio which is then turned in as part of their grade in SP 400 course before graduation. This has the advantage of giving the department an initial assessment as well as an outcome assessment. Washburn has direct exchange programs with Universidad de Cantabria in Spain, Universidad de Guanajuato in Mexico, University of Santiago de Compostela in Spain, and National University of Asunción in Paraguay. In order to minor in Spanish a student must complete 18 hours of course work beyond the 100 level. Of these 18 hours, 6 must be at the 300 level. The Spanish Conversation Table meets regularly during the semester for conversation. Spanish Table is a fun, informal chance to practice your Spanish with fellow students without the pressure of grades, and is an excellent chance to brush up your speaking skills or keep them current. Call the department at 670.1714 for information on the current meeting schedule. Contact the Modern Languages department for other information regarding the Spanish Conversation Table or the Spanish Club.